I was delighted to be invited to give one of the two keynote addresses to the Historic Libraries Forum annual conference. The HLF are one of the UK’s hardest-working organisations, bringing together and supporting the nation’s historic libraries. Over seven hundred libraries are members, and many of them send delegates to the HLF’s annual event. 2018’s event was on the theme of non-traditional library responsibilities, something that many of us working in libraries, independent or otherwise, know a lot about! Hosted at Christ Church College Oxford, courtesy of HLF committee member and CC College librarian Stephen Archer, the day was dedicated to knowledge-sharing of implementable best practice techniques. The HLF committee knew of Gladstone’s Library’s recent funding success, courtesy of the Carnegie Corporation of New York, and asked me to speak on how our tiny team is managing such a wonderful windfall. The conference delegates were a wonderful audience and seemed to enjoy learning about Gladstone, his foundation collections, and the work we are doing here at Gladstone’s to make them available internationally via an online content management system. Questions from the audience involved the practicalities of crowd-sourcing, the rapid development of free browsing software, and the provenance of Gladstone’s letters. I spoke to several delegates afterwards, including the fantastic Parker Library at Cambridge and we’ll be contacting one another to give and receive advice in turn. After my address it was lunch, and we were honoured to be hosted in Christ Church’s Hall – most widely known as Hogawart’s dining room. 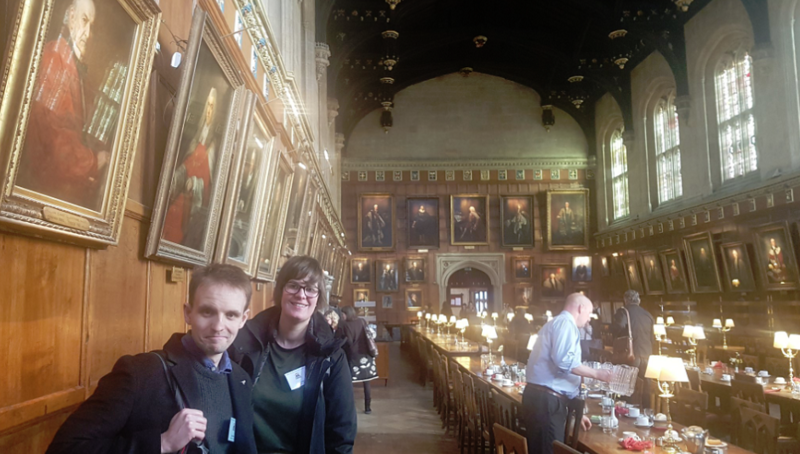 Despite having a choice of several hundred seats, my colleague Gary and I managed to sit (entirely accidentally) beneath the gaze of Gladstone’s Library’s eminent founder, a Christ Church graduate. It was wonderful to be able to bring news of a very twenty-first century approach to his letters to this place that was so important to him.